Waymo CEO John Krafcik: "We're serious about creating fully self-driving cars that can help millions of people." Pictured is Waymo's self-driving Chrysler Pacifica minivan. DETROIT -- Waymo, the standalone company formerly known as the Google self-driving car project, said Sunday it is has dramatically lowered the cost of lidar by 90 percent, and is building a suite of hardware that can be integrated as a unit into an existing car. The Waymo-built hardware suite will be first installed in the 100 Chrysler Pacificas the automaker acquired as part of a deal with Fiat Chrysler Automobiles. 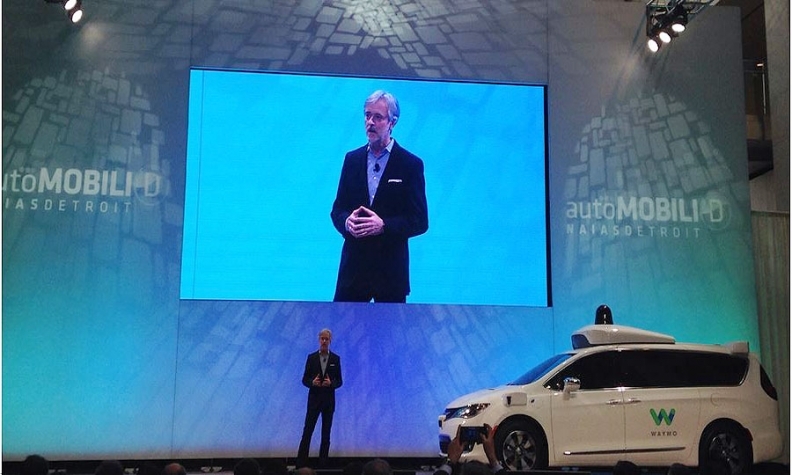 At Automobili-D, a conference running congruent to the Detroit auto show, Waymo CEO John Krafcik said the company has been developing a Level 4 autonomous driving system -- meaning no human intervention is needed in most situations -- using sensors and hardware it has developed in-house. Such vertical integration is another departure from traditional automakers, many of which announced partnerships with artificial intelligence and sensor suppliers such as Nvidia and Mobileye to develop autonomous driving systems during CES earlier this month. He added that Waymo’s self-driving hardware suite includes long, medium and short-range lidar sensors, and that by developing them on its own, the company has reduced its sensor production costs by 90 percent, down from $75,000. The system relies on camera and radar sensors as well, which have also been developed by Waymo. Other benefits of vertical integration include a better understanding of how the software and hardware work together and the ability to upgrade the technology on a faster timeline, Krafcik said. During his speech, Krafcik introduced Waymo’s self-driving Chrysler Pacifica minivan, which is part of a fleet of 100 vehicles provided through a partnership with FCA. The test fleet will be on California and Arizona roads later this month. Waymo has completed 2.5 million miles of autonomous testing on public roads and expects to hit 3 million by May. In October 2015, the company completed the first self-driving test run in a vehicle without a steering wheel or brake pedal on public roads. Waymo made its introduction as a standalone company in December. At the time, Krafrick said the company would not manufacture vehicles, but would license its technology to automakers.